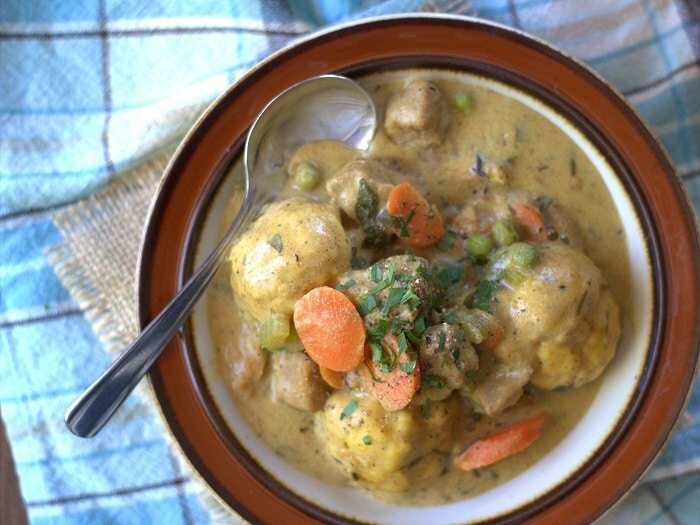 Tender rosemary dumplings, vegan chicken and veggies are simmered in a rich herbed broth in this hearty vegan chicken and dumplings stew from Mastering the Art of Vegan Cooking. Well now. Here we are, post Memorial Day, temperatures steadily climbing, and I’m posting a recipe for comfort food. Hearty, heavy, veganized chicken and dumplings no less. Serious comfort food. You know what though? It was really freaking good comfort food. No regrets. 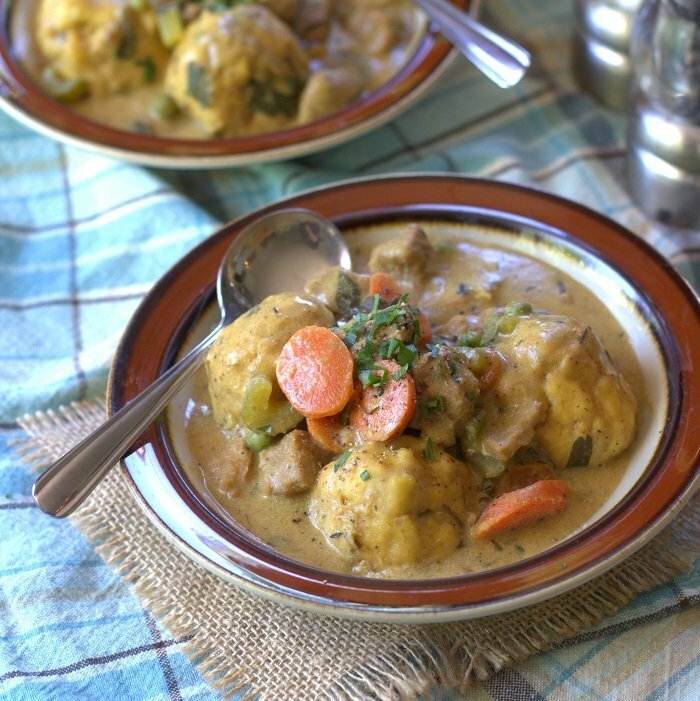 by Annie and Dan Shannon for review, along with an invitation to choose from a few recipes for posting, this vegan chicken and dumplings recipe was the one that grabbed me. I haven’t done nearly enough cookbook cooking since I began blogging. One of the nice things about cracking open a new cookbook and picking a recipe is that it’s often one I never would’ve come up with on my own, but no less delicious. I also tend to learn a thing or two when I branch out and start cooking according to someone else’s instructions. In this case I was dubious, for example, about throwing a whole cup of nutritional yeast into my stew, or using whole wheat flour as a thickener, but both worked out beautifully, and this was a delicious and indeed comforting dinner. The one adjustment I did make was to substitute seitan for the vegan chicken called for in the recipe. Feel free to go with either ingredient choice if you make this. I don’t use commercial meat substitutes a whole lot in my kitchen or on this blog, but I do recognize that good quality meat substitutes have a place, particularly for those new to a vegetarian or vegan diet. The recipe, as well as many others in the book, includes brand recommendations where meat substitutes are called for, which is pretty helpful because they’re not always interchangeable. On that note, I’ll say that this book would be perfect for veg newbies. 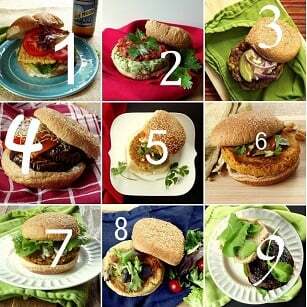 The recipes are versatile, relatively easy, and have a wide appeal. The book also offers plenty of practical tips on stuff like how to stock your vegan pantry and how to food shop as a vegan. There’s an entire chapter devoted to recipes for repurposing leftovers, which is a topic pretty near and dear to my heart. It even gives you a cost estimate per serving for each dish, which is great because I’ve found cost to be one of the biggest concerns for those wishing to cut animal products from their diet. 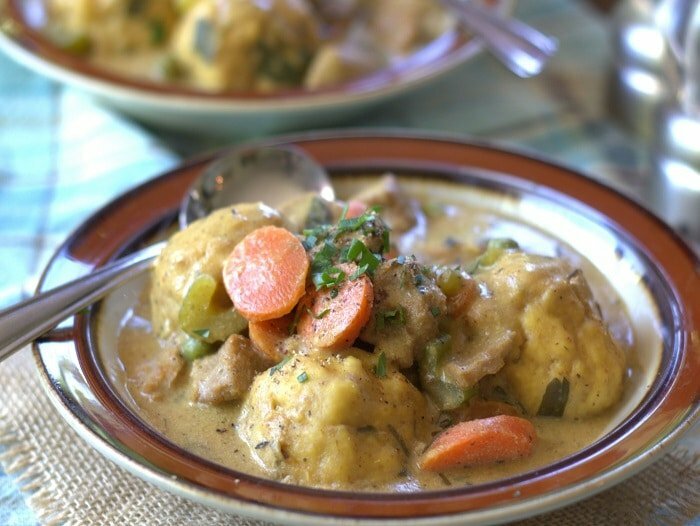 The chicklins & dumplins stew weighs in at a mere $1.99 per serving, and is incredibly tasty. My husband and I ate this on a chillier day when we were both feeling a bit cranky and beat up after a rough week. Hang on to this one – I’m sure you’ll find room for a little comfort dining in your spring. Make the chicklins stew: In your favorite Dutch oven or stew pot, heat the olive oil over medium heat. Toss in the vegan chicken and cook until it is browned and has crispy edges. Transfer it to a plate lined with a paper towel to soak up any extra oil, leaving the oil in the pan. Using a wooden spoon, stir the flour into the hot oil left in the pan. Add the vegan chicken broth and whisk in the nutritional yeast. Using a large wooden spoon, stir in the soy sauce, thyme, sage, rosemary, onion powder, garlic, peppercorns, parsley, celery seed, bay leaves, carrots, celery, and peas. Reduce the heat to low, cover, and let simmer for 15 minutes. Meanwhile, make the dumplins: In a large bowl, combine all the dumplins ingredients and use an electric handheld mixer to mix the ingredients until they form a firm batter. If you like a large dumpling, roll a portion of the dough into a ball about the size of your palm—but if you want to get more servings out of one recipe, use a soup spoon to form smaller dumplings instead. Raise the heat under the pot of stew to bring it to a boil. Drop the raw dumplings into the hot stew one at a time and stir them in with a wooden spoon. Make sure the dumplings get completely covered so they cook evenly. Let the dumplings simmer in the stew for 10 to 15 minutes. Single out the largest dumpling for sacrifice, remove it from the stew, and break it open. If it’s firm on the inside, you’re ready to eat! Mix in the cooked vegan chicken before serving with a few pinches of pepper over the top. I haven’t received any recipes from you in 2 weeks. Please put me back on your email list. I have really enjoyed them. Thank you. I have oh so missed chicken and dumplings! My Mama was Southern born and raised and made THE best C & D around! Thank you so much for this recipe, I can hardly wait to make it! This was so good! I hope you enjoy it as much as I did! These dimplings! oh my gosh. I was just complaining to my husband that I didn’t want fall to come (Florida girl living in the NY area) but these dumplings have me reconsidering. I haven’t tried seitan yet, but this looks like a great recipe to try it out in. You can use young jackfruit for a great chicken replacement. The texture is very similar and it doesn’t have a strong taste of its own. This wasn’t my favorite. Too much rosemary and to little veggies for me. I will definitely try other recipes from Alissa though. Can this be done GF?? Drooling…. I am planning to try this recipe GF but using my usual GF biscuit recipe with it instead because I have been making those for years and they always come out perfect. I am sure it has a lot to do with the GF flour I use as everything I make with it tastes completely “non-GF.” It is called Cup 4 Cup, and was invented by Thomas Keller of The French Laundry. It is amazing because you literally can just replace it “cup for cup” as a substitute for regular all purpose flour. It is truly indistinguishable. You can buy it at Whole Foods (pricy buy so worth it) as you can use it for everything you cook and bake that calls for regular flour and you won’t be able to tell the difference. I make a ton of soups and am not vegan (my husband is). I was craving a hearty stew. This was delicious!! We used mostly fresh herbs and more broth to make it a little less thick. The flavor was very savory. We think beans, tofu or mock duck would be just as good in the recipe. I wanted to use pea protein, Beyond Meat to add a different source of protein this time around. YUM. Will make again. I’m so glad to hear you both enjoyed it!! Thanks Nicole! Hi, What times and settings did you use when you adapted it to your instant pot? Thanks! This was absolutely DELICIOUS. I love the dumplings and the stew was so thick and hearty. Can’t wait to make this again! Yay!! I’m so glad you enjoyed it!! Thanks Hannah! This was wonderful, but my dumplings were a bit gummy/tough. What did I do wrong? Mix the batter too long? Under/overcook them? This is one of, if not the, best vegan dish I’ve every made. It’s so good I ended up making another batch 12 hours after the first. ZERO complaints here, thank you for sharing!! That’s awesome!! I’m so glad you enjoyed it! Thanks so much Michelle! What is nutritional yeast and where can I find it? Just made this using soy curls as my “meat”. I added one chopped fine leek, and 4 med sized red potatoes cut into chunks.. So absolutely delicious this is exactly what recipe I was needing for a vegan version of my favorite comfort food. Thank you so very much. Great idea to use soy curls! I’m glad you enjoyed it! Thanks Lisa! Can’t wait to try this. It’s getting to be perfect fall weather here. 1 cup of nooch sounds like a lot! Curious if anyone has found that overwhelming. I’d hate to miss out on deliciousness, but I’ll start with half the nooch because I also don’t like it when it overpowers all other flavors. I also wasn’t sure about using a full cup of nutritional yeast, but I found it totally worked! If you’re nervous, start with less and add stir in a bit at a time after you’ve let it simmer for 15 minutes (step 3). Oh boy…thanks for the warning! I just made this and it is amazing, very tasty and exactly what I wanted on this chilly day! Thank you for this recipe!! This was delicious. My first time ever cooking chicken and dumplings. I used the chicken of the woods we gathered a month or so ago and doubled the recipe. The meal was simple enough to do with three littles running around and didn’t take to long to complete either. Well definitely make its way to my “favorite meals” board as everyone in the family loved it. My husband commented it was more flavorful rehab his mother’s 😉 thank you for sharing, none of your recipes have ever let me down and have always been amazing! Such a great recipe and super easy too! It was a big hit for dinner tonight! You’re recipes have never let me down. Thank you!!!!! I’m so happy to hear all of that!! Thank you so much Jennifer! Can you make the stew portion ahead of time? Any substitutions for veggies if carrots and celery are not present? I think you’d be fine to make the stew portion in advance. It might thicken up during storage, but you can always thin it with some water. You could use just about any veggies – cauliflower, parsnips and even cabbage would be nice!